Ten people, but food for 50? That’s about right…. Beach resorts across the Philippines cover a multitude of styles, needs and budgets — from the opulent five-star models such as the white sands of Shangri La in Cebu, all the way down to low cost, no stars, no frills dilapidated beach huts on muddy tidal flats. You can find the cheap versions all across the Philippines, many with drop-dead gorgeous beaches and views. 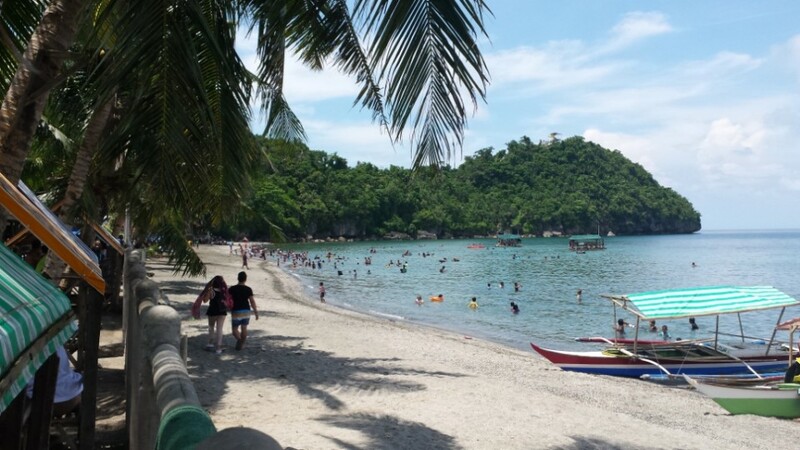 Here in Calbayog we don’t have the Shangri La versions, but we do have the Malajog Beach resorts about 15km from Calbayog City. Malajog beach sits in a lovely little cove surrounded by limestone headlands, with several nearby islands easily accessible. On calm days the water is clean and clear, with a pale grey sandy bottom. On other days the water is turbid and laden with plastic bags and all sorts of basura. This day Sunday, the water is clean, clear and sparking with just a slight wind as we arrive at ten in the morning. At this time of day the crowds are still missing and for a while it is just us and about 100 other people. Of course Sunday is the worst day to visit if you don’t want crowds, but we are celebrating a birthday and have no choice. Our party consists of 10 adults, six kids, one car, one tricycle and food for about 50 people. It is the worst thing imaginable, not to have too much food at a beach picnic, believe me. 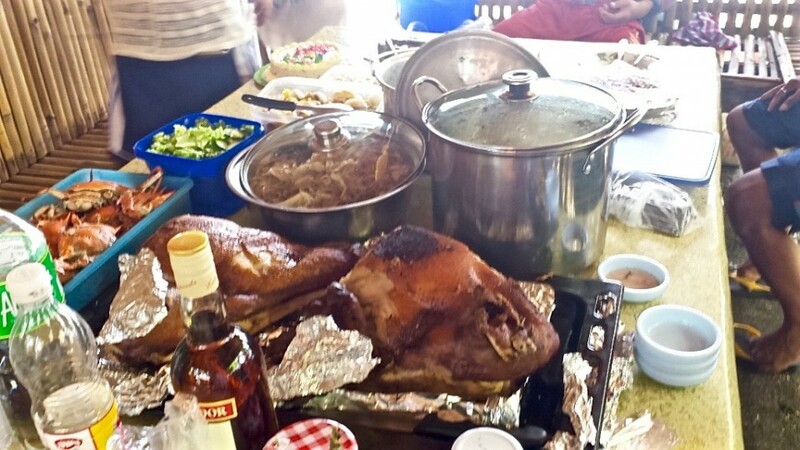 We have fish for grilling sinugba style, one pig’s head baked in an oven, Pancit noodles, crabs, boiled maize and sweet potato, steamed rice, majablanca (corn flour with corn, sugar, coconut milk and jackfruit), salad and a birthday cake. The sea is quiet and smooth with the faintest of ripples on the surface. We get a half beach hut at the end of the Malajog Leisure Park Beach Resort. It is suitable for about 25 people so comfortable for us. 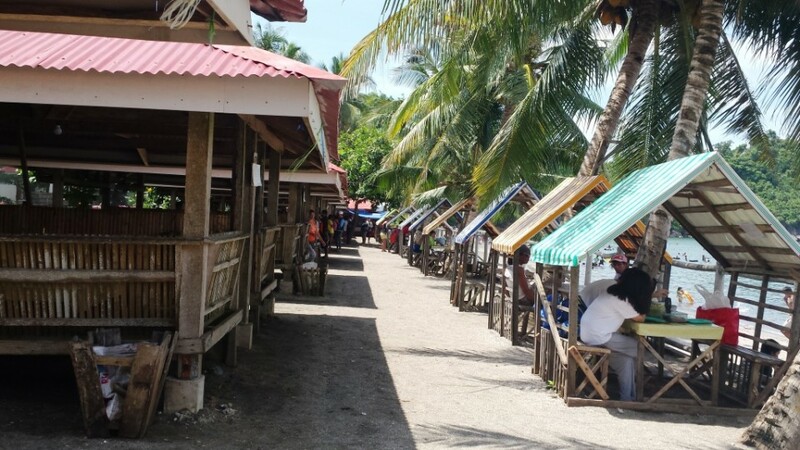 There are three other resorts along this stretch of the beach of about 500 metres. Our resort is the closest by far to any star ratings. That would be close to “1 star” by my ranking system. Our entrance fee is 30 pesos per adult and 10 pesos per child, with a 350-peso fee for the half-hut. Not cheap by local standards but it is quieter and less crowed, with only two karaoke systems available. Coconut palms are scattered throughout the beach area and provide great relief from the hot and burning sun. After a swim with my kids, I stroll back to our beach hut for coffee and snacks. It is now 11.30am and the crowd on the beach is at least 500 people I estimate. The closer to the headland, the higher the numbers of people, as the entrance costs are lower. It is approaching the critical period just before lunch and the numbers are now starting to rapidly swell. I can smell our fish and squid cooking on the charcoal grill next to our hut. Music from speaker systems mixes in with karaoke music in the distance and conversations. Not yet too loud, that comes after lunch. An ice cream vendor selling ice candy, ice cream, boiled peanuts and chicharon walks past ringing his bell like some misplaced Santa Claus. I grab an ube (purple yam) flavoured candy: it tastes delicious and refreshing. And so the lunch begins with a quick prayer and then the birthday cake candles are lit and the song is sung. Candles are blown out, wishes are made and then we get down to the real business of eating. All around us plates and people are moving across the beach. Noodles, fish, rice, squid and pork belly being consumed by now I estimate about 1,000 people. Lunch starts at about 11.30 and finishes … well it doesn’t really finish until there is no more food left on the tables. And, believe me, there is lots of food on the tables. 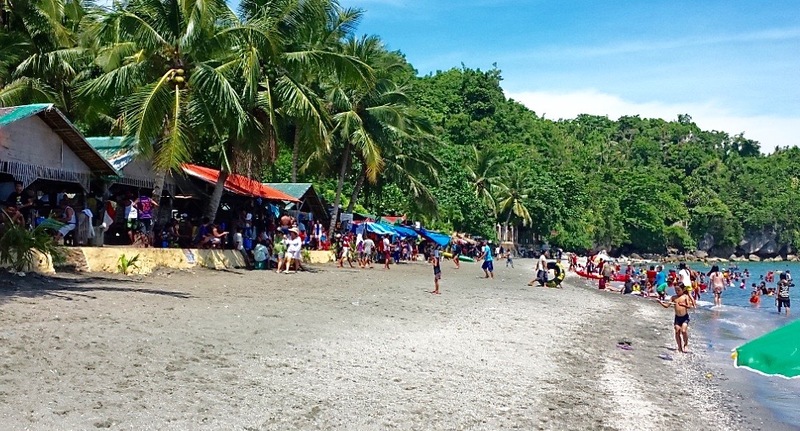 Throughout the day, the beach gets busier and busier…. By 12.30 I have had my fill of rice, pancit and fish all tasting delicious. I don’t have the stamina of Filipinos so withdraw from eating and go for a walk along the beach, towards the crowded headland area. There are now lots of people on the beach and in the huts. My last guess of 1000 is probably way too low. The atmosphere is now very different from when we arrived about three hours ago with less than 100 souls here. The karaoke systems are now firing up seriously with people fuelled up and ready to let lose their repressed talents. The screaming and laughter of kids, the laughter, joking and teasing of adults, the music from countless cell phones, speakers and portable stereos, the karaoke, the bells of food vendors, and the motors from the bancas all mix in to titillate the senses. Or give you a headache, depending on your point of view. A newly installed zip line carries people from the distant headland to an island about 800 meters off the coast. Every few minutes they come raining down, seemingly to crash into the island before being transported back by banca to the beach. It is an endless procession and no doubt a fortune is being made. For the fishermen it’s a great supplement to their income as well no doubt. At about 3pm we decide to call it a day and pack up. This takes us about 30 minutes given all of the stuff and people we brought with us. As we get ready to go I reflect on the beach picnic. I have been to many before on this and other beaches across the Philippines. For me, the Pinoy style beach picnic can be distilled down to four key ingredients for success: food, family, friends and talk. These four things Filipinos do well, with great gusto and naturally. Life in this collection of 7107 islands is about being together, sharing, laughing and crying. Life with its myriad problems, challenges and disappointments can be faced head-on if you have these ingredients as your reserve. That is the real strength of people power. Well I hope that this article was entertaining and informative for you. If you want to read more of my writing and novels please visit my website and novels section here. Cheers for now. Nic Richards lives in Samar province with his family. He works in international development assistance, is an agriculture expert and writes novels. Black Hearts, Gold Warriors is his second novel and is an action adventure that ranges from Mindanao to Vietnam and plays out from the end of World War Two to the start of the new millennium. His debut novel, Gold of the Generals — a tale of the hunt for wartime treasure in the Philippines and Papua New Guinea — is currently being revised and will be re-released soon. For more information, visit nkrichards.com.